Well, I guess KISSING ON THE MOUTH is a home movie. You heard it here first. I think it's really sad that an orgaization which exists to help actors would think that by undermining filmmakers, they might make some headway into the new digital filmmaking world. This advertisement is the kind of desperate stuff that I've come to expect from organizations who are clinging to any sense of relevancy. Before it was, "If you shoot on DV, it's just a home movie." 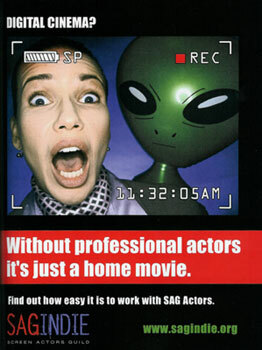 Now it's, "If you don't use professional actors, it's just a home movie." Next it will be, "If you self distribute, it's just a home movie." It makes me laugh. This is what happens when business people try and control art. They always lose their grasp on it and start flailing around, because they don't realize that there are a ton of people out there who want nothing to do with their system. They blame DV, or the internet, but the truth is, even if I made this film on 16mm and spent $20,000, I still wouldn't have had any desire to use SAGINDIE.